Steve: Welcome to all of our Becoming Your Best podcast listeners wherever you might be in the world today. This is Steve Shallenberger, your host and I am so excited with our guest today. I’m going to tell you a little bit about her first and introduce her and then we’ll have the chance to hear from her. She is one of the founders of Hari Mari, a company that brings clever, color and superlative comfort together in a singular flip flop creating looks as unique as the people who wear them. Hari Mari is dedicated to providing a great pair of flip flops but more importantly they also are helping a lot of people around the world – incredibly brave children. They donate 1 percent of all of their sales to support kids battling pediatric cancer. Welcome Lila Stewart. Lila: Steve thank you so much for having me what an honor to be visiting with you today. And I don’t know if I can live up to that intro but I’m going to certainly try. Steve: You’re already doing it and we’re gonna have fun today. Our listeners are going to love our visit, I am quite sure. Lila: Why I’m looking forward to it as well. Thank you again. Steve: Okay. Good. Well let’s jump right into things and Lila tell us about your background and especially including any turning points in your life that’s had a big impact on you and really what you’re doing today. Lila: Okay sure. So, Jeremy and I are both from Dallas, grew up here in Texas and I went to the University of Arizona. And all through college knew that I wanted to eventually get into the music business. So, I worked towards that throughout college as well as immediately after college working for a company called AEG Live and was really excited about the opportunity. And after a few years I’d worked my way up to a sales manager role and my boyfriend at the time, Jeremy, who is now my husband, out of the blue calls me and says well I have an opportunity to move to Jakarta, Indonesia, and will you come with me. And it was definitely a struggle. And you know trying to make a decision between continuing to work on my career which I’d worked so hard to get to and get to the place where I was or go follow my boyfriend and soon to be fiancée and husband to off on this adventure to a country I’d never been to and nor knew anything about. And so, it took me a little bit of time and persuasion, but I ultimately said yes, let’s go do this. And so, in 2007 I said goodbye to my job and career and took the plunge and moved to Jakarta. And I mention it because it eventually ties back in the story of our brand and our DNA and our philanthropy and in the name of the company but also because it was probably the most impactful move and life change that I’ve ever experienced, and it changed me for good. And we wouldn’t have Hari Mari if we hadn’t made that move. So, I can continue to elaborate about our time there and I’d love to. But that’s a little bit about my background where I’m from and so this was 2007 and I’m in Jakarta and we were there for about three years. Both of us working on different projects pertaining to helping kids, we’re trying to do a little bit good in Southeast Asia. So, Jeremy was working on, worked on excuse me, a documentary called Hungry Is the Tiger focusing on malnutrition and how it affects kids in Southeast Asia because as anyone from Southeast Asia would know unfortunately a lot of times they’re lacking in the education component of how to best feed their kids. So, for example in the villages you’ll see a lot of moms giving their children rice water runoff thinking it has the same nutrition value as milk. And the list goes on but so he enjoyed working on that component and I got on the board for the American Women’s Association and spent my time helping kids in orphanages in and around Jakarta and gosh we just had this crazy cool, interesting, unique, life changing experience and knew that when we moved back we wanted to do something to continue to help kids but do it here in the US. Steve: Okay. Wow. That is fun and you’re never the same, are you? Steve: We’ve had a similar experience of living in Europe for three years and then we’ve had the good fortune and privilege of working in both the African area, Rwanda, and other African countries and then also some fabulous people in the Philippines. And you’re just never the same, you’ll see different circumstances than maybe you’re used to, and it does change you. So great going. I know that it has blessed our lives and helped me see a different world. Lila: Absolutely. It definitely helps put your priorities into perspective and it was an incredible opportunity that I’m thankful for to this day. Steve: Yeah great. Okay. Well let’s talk then about this shift, this pivot. You move back to the United States in about 2010. Steve: And so you’re on the hunt for something to do or did you already have the idea? Lila: No we didn’t. It’s kind of funny and a little bit backwards in that we had our philanthropy decided before we had the business. We knew we were so changed by our experience and knew that we wanted to continue to help kids and so we decided on on pediatric cancer it’s the most fatal disease of children in the US more so than all childhood diseases combined. So that was set that was that was firm, but we were trying to decide what was next and had a bunch of different ideas many of which I’m embarrassed to admit now but we ultimately decided on flip flops and for a bunch of different reasons. I mean really just the rise of casual wear and we’re basically on this ever ceasing trend towards casual wear that’s not going away in the days of suits are dwindling and with that obviously flip flops sales are on the rise and we had just noticed that there weren’t a lot of new entrants on the scene especially in the premium flip flops space and the market was really fragmented in terms of who was there. So, we thought okay well maybe if we can combine certain certain ideals and our philanthropy and come to market with something premium and give back we might might have something. Steve: So why flip flops? Where did that idea come from? Lila: Well we’re both pretty casual people and we went to a store here in Dallas and we’d worn out our flip flops that we’d worn for the three years we were in Indonesia and we noticed that literally Steve the exact same flip flops that were hanging on the walls when we left in 2007, we’re still hanging in 2010. Maybe different iterations of black and brown but it was the same brands producing the same status quo. So that’s how the idea began. Steve: That’s wonderful. One of my mentors and really great friends Thomas Monson very early in my career gave some wonderful advice to me in three major piece of advice but one of those was to serve a large fields. Kind of think of your core straight your abilities your passion and what you may be capable of doing but then cultivate small ones and become the very best at what you do. Become like a badger in a hole so nobody can get you out of that hole. Steve: And that’s what you’re doing. You are amazing. You folks are transforming flip flops. Lila: Well I don’t know about that but we’re certainly trying to carve out a little niche and be really good at what we do and see what comes of it. Steve: Okay. So, what are some roadblocks that you encountered when creating Hari Mari and how did you overcome them? Because I’m sure a lot of our listeners and especially in different parts of the world but certainly in the United States anybody creating a new idea or trying to launch an idea is going to encounter maybe some of the same thing. So, what were some of the roadblocks, challenges you encountered and how did you overcome them? Lila: Gosh where do I began. Steve: I know it’s such a big question. Lila: More than anyone would imagine. There were many everything from you know quality control to finding talent here in Dallas and not that Dallas doesn’t have amazing talent because it does. But we were such an anomaly. We still are. We’re the only national flip flop brand that isn’t headquartered in California. When we first got started people thought we were nuts. So, like what are you doing. You’re starting flip flops. You have a new mortgage and a baby on the way and you’re not in California. What are you doing? For us it was just putting our head down and not letting any of the naysayers affect our vision and just plowing through it and really just taking the hits as they came and just continuing to grin and bear it. There’s nothing else you can do. You just can’t give up. And so, we had so many I can dive into specifics and if you’d like as there were so many but really ultimately all it was was not allowing it to deflate you or defeat you or bring you down. You just have to keep trucking. Steve: Yeah. So how did you get started, Lila? Did you start with a few brands or models or how did you really jump into the marketplace? Lila: So we knew our favorite brand. We knew that it had been a long time since any kind of updates have been made to it. So, what we did was we went and purchased probably 10 different pairs and literally started cutting them up and seeing what what was on the inside what wasn’t on the inside and really focusing on what we liked what we didn’t like about all these products. And then from there we had our kind of vision about what we thought would work but then we also had scheduled focus groups. So, talking of all ages, all walks of life, all backgrounds saying what do you like what do you not like about flip flops and as ridiculous as that might sound it was so incredibly helpful because we really got to kind of tap into kind of mainstream thoughts about the market and products specifically behind it. So that was hugely helpful. And from that point we kind of laugh to this day. Jeremy drew like crayon sketches of our well what we wanted everything to look like and literally sent that to the factory and that’s how we got started I mean just no idea what we were doing but just kind of figuring it out and doing our best day to day. Lila: Well good for you and Lila how did you connect with customers? How did you get the word out? Steve: That was definitely a challenge and it still is. I mean we’re still is and almost seven-year-old brand that’s still something that we struggle with. We spent a lot of time on PR internally the day we launched. We were fortunate enough to have Thrillist feature us. We did over 100 events like in here in Dallas, grassroots events getting the name out gosh talking to as many people as we could at those events whether they made a purchase or whether they didn’t really just trying to tell them about Hari Mari. But it’s tough because hiring a PR firm especially as a new company can be really expensive. So, we decided to focus on it internally. But I was fortunate enough to get some great press hits and then spent a lot of capital but also time on the website to make it hopefully enjoyable and you know make us appear bigger than we were because we were new. But really, I think the events at the end of the day doing so many in such a short period of time had a lot to do with that. Steve: Okay. Good for you and how was it in the early years versus how is it now? Lila: Well we’re fortunate enough now that we have an amazing amazing team and we couldn’t do it without them. It’s just different now and then when we started it was really just my husband and I and my younger brother at the time was helping us, so we still are learning every day and trying to become better at what we do. But we’d never worked in retail we’d never been in manufacturing. This was like a whole new world for us. So not knowing having a clue what we’re doing back then I feel like we know a little bit more even though we’re still figuring it out. So that’s a little bit of the difference just having confidence and the experience that we’ve had over the years and you know the confidence of our vision for Hari Mari. But I think a lot of the difference is just having a great team. Steve: Okay. Yeah, that really makes a difference doesn’t it. Steve: Getting others involved. Would you mind sharing with our listeners some of your key business philosophies. What are some of the important things for your business that contribute to success? Lila: Well I think Jeremy and I would probably be aligned in this and not it’s pretty simple and threefold and that one work hard, two stay humble and three take care of your team. And then I also think it’s important to not listen to the naysayers not listen to the negativity and run your own race. Steve: Okay good. 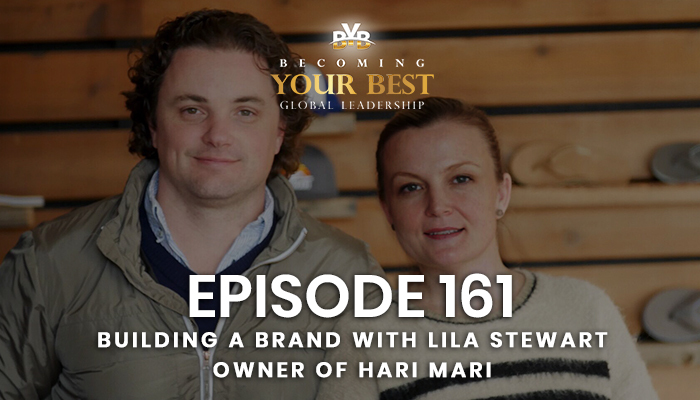 Lila and I had the opportunity before we started today to talk a little about Becoming Your Best and thank you for your comments by the way. Lila: Such a great book. I loved it, I really did. Steve: And I could sense as we talked before and even now that these 12 principles of highly successful leaders are certain things certainly things, you’re working on of being true to character, honesty and integrity, people can depend upon you. And then you set a vision and no doubt you have annual goals for 2019. You’re not just aimlessly diving in right. Lila: Right. We certainly didn’t have those in the beginning. We we definitely dived in not gotten any better and ordered a crazy number of flip flops when we first started because we didn’t know any better. But yes, fortunately we now have goals and I’m a big believer in that and a vision board which I know you also speak about in your book and just really focusing on those goals to make them happen. Steve: Yeah. And then the other thing that Lila has been talking about is how important the team is and building a winning culture where people know well for example, I can tell in visiting with Lila that they live the golden rule. Steve: Well you work on it. Lila: Yeah, it’s a work in progress and we’re certainly we’re human and know better than anybody else. But I think you learn the more the longer we are in business the more you do learn and you’re so right in your book that you have to you’ve got to strive for that because what kind of an example are you setting if you don’t to your team. But in addition to that you want them to do the same and set that example for the next people that come in. So, it’s really important to lay that foundation. But it’s also hard in hiring especially as a new company and a new brand. You are sometimes you know it’s tough because you’re still learning how to hire and what to look for and then how to manage and sometimes you get some someone that isn’t living up to it and you don’t see it as quick as you should or something you may have missed in the interview. All of which you learn from. But yeah, it’s it’s hard managing people’s hard but the team is so crucial to everything. Steve: Indeed it is, and I can sense this that you’re building a high trust with your people or at least working to build a high trust and then you start unleashing a team which creates this innovation and it’s no longer just Jeremy and Lila. Now you have a group that’s really unleashing on this and these are the things that kind of help you get to the top. Lila: Yeah exactly. When we first started it was funny because our combined philosophy was if you want something to get right, you going to do it yourself. And my goodness, that’s changed with this amazing team that we are now surrounded by. Because it’s no longer us doing everything. We’ve got a great team to do it. And trusting them to do it. And they have the best intention in doing it. And just like us they’re going to make mistakes. But that’s a part of learning, right? Steve: Indeed. Yes, it is. I’d be interested you mentioned earlier Lila about the 1 percent of all sales or a portion of what you do goes to pediatric cancer. You talked about how deadly it is. Where did the inspiration come to do this type of humanitarian good with part of your enterprise? Lila: Well actually living in Indonesia we were changed we moved back in our priorities had been readjusted and we thought about continuing to try and help Indonesians. But once I was actually pregnant with our first daughter at the time and she’s a healthy little girl and we learned a lot about pediatric cancer and the statistics behind it and it’s pretty mind boggling to look at it. One in every 400 children die from cancer and it’s more fatal than all childhood diseases combined and it’s just crazy that with modern medicine and you know the amount of funds that our healthcare has access to it’s just it shouldn’t be that way. So, we felt that there was a need and we could do it here in the US and be transparent about it but be hands on with it. We go to our partner hospitals three four five times a year and do flip flop drops and give flip flops to the kids there that are being are being treated there for pediatric Cancer and it’s just something that not everyone may care about or be passionate about, but we love it. And it’s really special for us to be able to do it. And you know it really is a part of Hari Mari’s DNA and it’s exciting to think that as we grow, we’ll be able to increase our flops fighting cancer donations and we just love it but are grateful in doing it. We’re thankful for it. We meet these kids at these hospitals and that’s just heartbreaking. But I just feel very fortunate that we’re that we’re able to do it and fortunate to our customers that really make it happen. Steve: Well it makes what you do a lot more meaningful doesn’t it? Lila: It absolutely does. Absolutely. Steve: Yeah great going. That’s a not only a great example but it is so inspirational. I mean if we can leave the world better than when we found it maybe when it’s all said and done besides family and friends that’s what it’s about. Steve: Yeah. Good going. Okay well let’s finish up as we go towards the end of hitting a few business issues that might be common for a lot of folks and maybe some could learn from things that you’re going through and certainly consumption levels continue to increase in our modern-day society. There’s more products more choices. And it is difficult for brands to differentiate themselves in the marketplace. So how have you done that at Hari Mari? What steps do you take to try to stand out among your competitors? Lila: Well that’s such a great question because when I’m in meetings with our buyers Nordstrom or Zappos or whomever it may be in the beginning that was the very first question, they would ask me. Oh another flip flop brand. Great. Well have you differentiated yourself. And so, we set out from the very beginning to really focus on focus on comfort, minimal break-in periods, quality and premium materials and sourcing materials that are a lot nicer and more elevated than what you’d see on the market. But one thing that was so pivotal and that came out of our focus groups before we launched was people complaining about the toe piece which is the post that goes in between your first and second toe. And so, because of that feedback we went and designed and filed patent for our memory foam toe piece. And so, we we received it recently and it really does set ourselves apart. It helps with break-ins and so we thought in a world of flip flops that are uncomfortable and break and are bad for the environment because they’re plastic and rubber. We thought we would focus on using premium materials, make them last longer, minimal break-in periods and really kind of set ourselves apart in that regard. Steve: Well how fun. I mean you are making flip flops exciting. Steve: I mean I can’t wait to go out I can’t wait to get out buy my Hari Mari flip flops. Lila: Steve you’re gonna be getting a pair in the mail here pretty soon. Steve: All right. But I mean stay posted everybody we’re not done. Oh, that’s great. Now you’re just about to launch three lines of closed toed shoes. Can you tell us a little about what that means for you and your company? Lila: Yes, we’re really excited about it. It’s something we’ve been thinking about for years and the prototypes that we’ve designed have been terrible, but we were finally able to push something through the finish line. We’ve got three lines coming out for men we’re going to start with men’s, women’s next year. It means a lot for Hari Mari. First our customers have been asking for it which is incredible. So to be able to produce something and know that guys are going be in our product hopefully year around is super cool but also it’s tough having a seasonal business and it’s been a real challenge over the years because you know when it’s warm you know Hari Mari is doing great but once it gets cold people aren’t buying flip flops and to run a business that way is really challenging. So, it’s gonna be great to have year round product and be more of a year round company person is a seasonal line. It’s a big step even though it’s still footwear it’s still a big step to go from flip flops to shoes. The response has been great so far. We took it to trade shows and kind of tested the waters and so many of our accounts have purchased it Zappos and Nordstrom and we’re so grateful for that but time will talk as we launch here in about two weeks. Steve: Oh my goodness. Well good luck on your new product line. Lila: Thank you. Thank you. Steve: Okay. So what does the future hold for you and Hari Mari? Lila: Oh goodness Steve I don’t know, we have a long way to go. I love it. We get this question a lot. If we have interest in exiting or selling and I just couldn’t imagine not doing it because we love it so much but I do think that you know our goals are to become a top of mind flip flop brand and be known for somebody that to everyone hopefully you know someone that makes a really good flip flop and gives back along the way and so I hope we can continue to do that and become more of a not necessarily a household name but just become better known. Steve: Well good well on one of our trips a few years ago to Hawaii I bought a pair of flip flops and that’s what I use here around the house. Just casually but they are what you’ve described. And so, I am excited for some new flip flops. Lila: Well, that’s awesome. Well we decided to send you some and see what you think. Steve: I’m going to make some as gifts to others too, so I’ll test them. But we’ll will become one of your customers so good go. Lila: Well we appreciate that. Thank you. Steve: You bet. Now any final tips that you would like to leave with our listeners today? Lila: Gosh that’s a loaded question for us. I think what’s some lessons we learned over the years and you do talk about this in your book but some being repetitive in that regard and isn’t anything unique to Hari Mari I’m kind of ripping off your book here Steve, but I think gratitude is hugely important. I think the more we we lead and live with gratitude in what we do the better off we are as a company. Steve: Indeed this has been fun today. So excited to hear about the things that you’re doing, the differences that you’re working on in the marketplace, the excellence that you’re working on you’re working to create, the Becoming Your Best individually and as an organization. And so, I just want to thank you. Good going. Lila: Oh I so appreciate your time and your interest in visiting and your kind words and I appreciate the platform to be able to connect with your listeners. So, thank you, Steve. Steve: You bet. Now how can people find out about what you’re doing and check out your products? Lila: Hari Mari dot com. H A R I M A R I dot com. Steve: Okay. Well there you have it folks this has been a lot of fun today. Thank you, Lila, for being a part of this show today. What a great and productive visit this has been. We wish you all the best as you’re making a difference in the world. So, go get them.